Denny was given much criticism over his 30th place qualifying run, but once again proved everyone wrong, won his 8th race of 2010, and captured the points lead 33 points ahead of Jimmy Johnson. 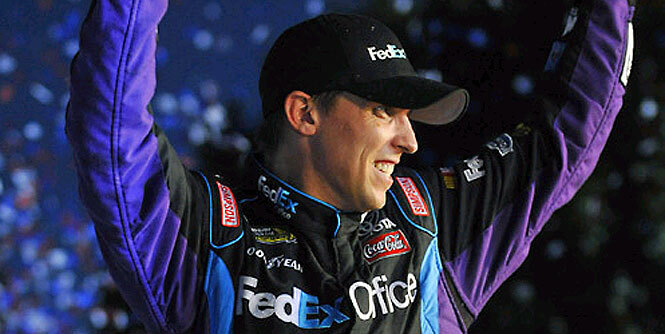 Hamlin was patient throughout the day and worked his way through the field. Denny was up to 20th early in the race, but during a pit stop was blocked in by the #82 of Scott Speed. Denny lost 7 positions and restarted 27th. Denny worked his way up to 22nd again before another yellow came out. Denny pitted once again but only took 2 tires this time. Denny gained track position with this move and restarted 14th. After taking two tires, Denny’s car lit up and he made his way up to 5th very quickly. Denny still complained of a loose car, a problem he had most of the day. With 30 laps to go, Denny finally passed the race leader Mark Martin. Denny had a huge lead from here with Matt Kenseth 2 seconds back. Another caution flew with 7 laps to go, and Denny and 9 other cars stayed out. Denny said the balance was perfect and was confident he could win with this move. Denny restarted on the outside of Matt Kenseth. On the start Matt Kenseth got ahead of Denny in the first turn. Matt hit the wall coming out of the turn 2 on the last lap, and Denny dove down below him to grab his 8th win of the season. 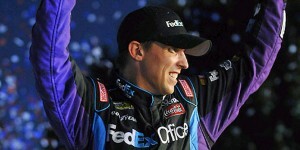 Denny is now 33 points ahead of Jimmie Johnson and now heads off to two of his best tracks, Phoenix, and Homestead.